Electronics hobbyists enjoy playing with the projects.some people start a garage at home. For making any new invention you don't need any big laboratory. you can make your home a LAB.to work you just need a "multimeter". I have been working on some projects.At the beginning stage i made so many disasters in my room.I blasted so many components(one day i burnt my bed).what ever we do we enjoy that.So i just wanted to share some of my work with you. People often use ARDUINO platforms and other microcontrollers (pic, avr ) for making a propeller led display. If you are from a rural area like me it will be a little difficult to have such good hardware.I am trying to make one using AT89S52 microcontroller (which is very cheep). It is better to connect the leds in active low configuration(cathode to MCU pin and anode to Vcc through 220ohm resister for current limiting. the wheel is attached to 6mm shaft and 1000RPM metal gare motor. Keep the arrangement as strong as possible. So that it won't fall out of the high speed rotating platform.Try to make it stable to suppress the vibrations at high speed. I attached the 9V battery using a tape to the circuit board of MCU .It means I am using "ON BOARD" power supply. I arranged the LEDs on a separate PCB and connected them to the pinheads and an eight pin female connector is used to connect the 8 LEDs to connect to PORT0 of AT89S52. I used the KIEL software to program the microcontroller. i prefer to work with C rather than assembly. I am using a USB based programmer to burn the AT89S52 MCU. looks nice is isn't it. I'm trying to make a single stand still display. calculation of proper delay is very important in making this project.because speed of any two motors is not equal.calculate delay as per your motor.motor speed should not be less than 1000.
if your motor is rotating in clock wise direction then the corresponding code will be as follows. display('A'); // this displays a continious rotating"A A A A"
// this "A" is simetrical so works on both directions. i m giving the example for understanding the logic of this project.you can extend the code by adding number of "switch cases" i made it for active low logic means logic zero indicates led glowing and one indicates off. with this technique you can make your own custom designs like "heart " "smile"
by changing the "del" variable value you can change the width of a letter.because no two motors are alike. This propeller LED display can be made stable using an interrupt source. An IR sensor can be used to make it stable. Better to use a IR slot sensor as shown in the picture it will be a faster compared to an LM358 based sensor. if your motor is faster than 1500 rpm then this sensor is the best. in the above pic the fan is shaking due to weight imbalance. this is due to improper delay between the letters. DON'T JUST ASK FOR THE ENTIRE CODE. nice work, bt wht sud i have to for inserting a analog clock...??? n how to calculate a proper delay, if my mmotor is of 150rpm?? Good Work, I am bachelor in Mechatronics Enng., I need a favor from your side. I am working on a project on Speed control of AC motor by 8051 Microcontroller, in which motor starts,then i required to reduce the speed of motor after 10 sec. and it would stop around 14 sec. very good job. 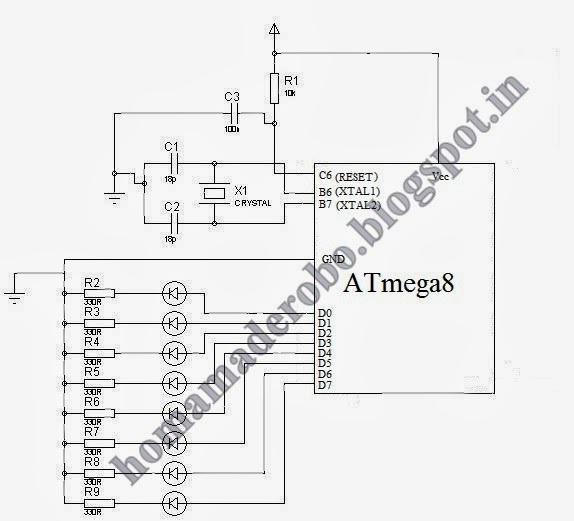 can you provide the circuit diagram and the program for atmega16? any microcontroller of you choice and required components like crystal,pcb,ic bases, capacitors. hello sir i want to connect IR sensor for automatic interrupt so i dont hav to set delay and so wht r the modification u suggest. if you use ATmega16 or ATmega8 as the CPU is very faster you can just use "if" statement. what crystal are you saying sir? is it optional or its required for this project? another one sir. . what kind of pcb is your using?? im not familiar of pcb. .
on board power supply means we use dc battery. we cannot use adopters from power sockets. Guys please respect the author. I could see many of you asking certain redundant things when he has written it clearly what is the most necessary or the crux. So please stick to asking clarifications on things that have not been covered. Vamsi, I really feel honored to have seen your blog. Really a great article. You made me feel the complex rocket science to be a mere a butter cutting with your code. Thanks a lot Vamsi. But I need a clarification. What do these hexa integers mean ? Are they only the on-off states or do they point to the port number. Consider I am using the ATmega16. 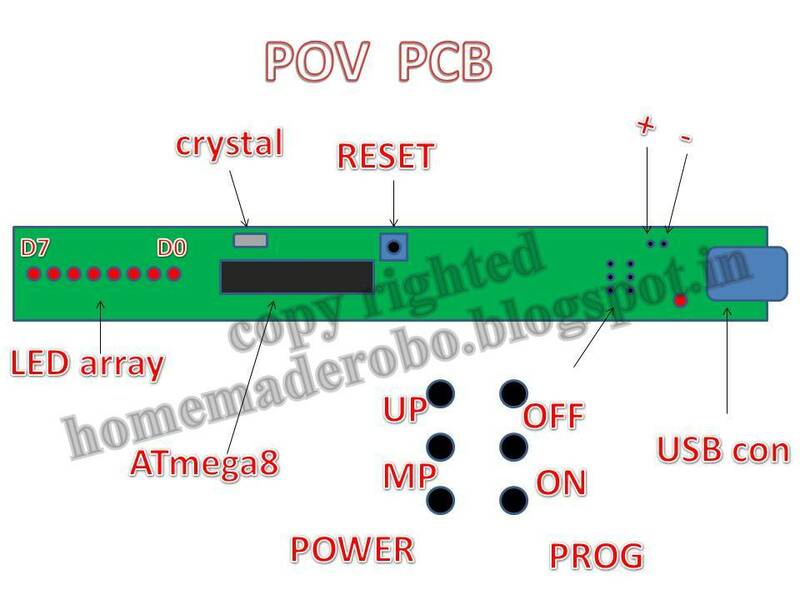 refer to the example letter "A"
in the beginning i defined port P0 of 8051 MCU as "led"
Don't you think as per your character mapping of A? helo sir thx for previous rply i made hardware for project success fully n i write code also i am using 1000 RPM motor but my word are stretching can u tell me how much delay should i use to achieve output lyk urs. can u please email me the code and the circuit diagram please i really want to makde this cool project ..
the circuit is similar to a "light chaser project" published on "Electronics For You" magazine. but make sure that the fan is rotating at some low speed level step. wow..a great project.now, i'm working with this project. can you send me the schematic and design for both atmega16 and AT89S51. this is my email zero_shin@yahoo.com. if you want to use interrupt using IR sensor connect it to INT0/INT1 pins and write the display function in interrupt service routine. hello..i need the code for atmega16 for analog propeller clock i am thinking to take the output of RTC for the clock values..reply how can i do dis.? I have already implemented the circuit. I just need the codes. please. the over all algorithm for writing the code is made according to my circuit and and LED arrangement on the rotating arm. Thank you.. I analyzed your code and Developed my own code according to the need. At first the delay wasn't proper, so took a while to figure out exact delay. Finally, I completed it and my Professors are happy for it. Thanks once again. i gave it for 8051 and ATmega16(AVR) micro-controllers. what compiler you are using ? ok sir thank u very much for your reply... can u exactly tell me that which motor you had used?? so that i buy it from the shop as u tell me its name,,, and in your example program in keil i found some errors.. can u resolve it??? OK sir thanks........ one another question...please check a programme once i got an error.....and i m not able to resolve it........can u do this??? Sir i am finding this project since 3 months......on your blog i found it......... i had started work for this project from one week....but i am getting failure and failure......i had made hardware and software as u suggest but i found only failure...can u help ? i had made program for six letters but out put is only for 4 letters... i want to write Bharat but "Bhar" is displaying.........whts the problm of tht? ok sir...........one more question? the length of the rotating arm should be long or short?? ?for displaying more letters??? can you plz provide keil microvision code? and the logic for clock. my Shaft is around 5 or 6 C.m .......... It is sufficient??? Oh.my god.... you are mind blowing sir......... heads off to u......Thanx for replies..and ur guidance...... i exactly measure radius= 7 c.m.. and for that i had put delay as below..
and this will displaying only 4 and a half letters..
connect a pot to ADC and ADC to microcontroller for 8 bit you will get 0 to 255 value use it for the delay. don't forget to keep this function outside the while() function. ok sir..........sorry sir but i can't understand about u say. "pot" u mean to say a motor? i have to connect motor to ADC and ADC to 8051 right? and this arrangement on the propeller shaft?? ok sir i understand... POT means Potentiometre right?? and sir can u just check or examine my video? i had made propeller display and upload on youtube....... can u just check that video for suggestion and improvement if u have time ??please? this is the link sir..
Can I have your mail ID sir for communicate adequately........?? okkkkkkkkkk sir...when u complete it must put its video... and if u want any small help i m ready to do it...coz i m very interested in this stuff.. thnk u sir..
had u used pull up resistors for PORT 0?? ok ... for ir sensor can i use TSOP or anything else??? hello..i need the code for 8051 for analog propeller clock i am thinking to take the output of RTC for the clock values..reply how can i do dis.? so that we can see it..
hi sir i need the c code for it with interrupt INT0 . What is the working of the IR Sensor...?? And which one have you used...?? what if we give a input by means of a keypad...like the user is supposed to enter either of the buttons of the keypad and then we get a display according to that...each number having a fixed display associated with it...?? you need to store the data at run time and that should display even after the power loss. I am not getting...Can you please elaborate ...?? hi sir, could you tell me how about the wiring of the power supply? I mean isn't there a chance of the wiring having a lose contact and coming in the way of the motion of the display? It would also be nice if you provide the applications in everyday life for such displays? thank you. 2) imagine you raiding a bicycle or bike.. I need more info on stabilizing the display. with your blog help i had made the display but cant stabilize it. What will be the calculations if i use opto-interrupter switch?. Shouldi take take of the delay all the time by calculating rpm of motor. I have also mailed to mr. kshitj moni. Dear Friend please elaborate your work on stabilizing the display it will help us a lot. I am workingwith pic microcontrollers. also called "DC cooling FAN"
don't directly go to the auto delay calculations using timers. i will confuse you. first stabilize the display with any random delay. once you got the stable display then adjust the delay value manually in the program. please respond asap.I participated in a expo to be held at 17 feb .I wrote so many codes for pov and using the default delay function _delay_ms() made the hex file larger than 16 kb.so I can display a max of 3letters or size of hex becomes unprogrammable in atmega16.plz suggest sth.have been trying 2fix it but with no success. Hello VAMSI, i want to build this propeller clock using AT89S51, if you could email me the code at s.atayi379@gmail.com. Many thanks. Hello Vamsi Sir, I am trying to to do the spinning display project.I m facing problem in Placement of batteries on pcb. if i do so the pcb is becoming heavy and wobbling while rotating. Also if I use IR led photo diode pair for external interrupt, its not being sensed by controller at high rpm(I am using 1000rpm motor). Which type of sensor I must use sir? and which type of battery shall i use to power up controller? What type of slip ring have you used for the project for the power supply....??? Vamsi Sir, I'm having a problem in finding the motor with the precise specifications(rpm,torque) from the local Kolkata market.I am trying to use a 1000rpm motor.Can you suggest me where I can order for these motors? What kind of motor did u use for your Propeller LED display project and from where did u buy it? sir i need to know how you use interrupt, and what you use for interrupt and also interrupt code. sir it is possible if i connect it to gsm technology then the received message will be the display?? i plan to use 15 led's. and i successfully display the latter but its still unstable , i read whole article of you. you asked for slot sensor to use for stable the display . can you please help me that how to connect the slot sensor to the interrupt pin of the 8051.
if rpm is 1000 then time for 1 rotation must be 3.6ms isn't it??? @ VAMSI DANDA you should put the image of o/p of the program u have given for example..
as i under stand there will be a letter A first then one column gap then 5 column gap then again letter A..am i right?? I want to make this project but i should understand the logic first..
hello sir i need the whole circuit and program to display ADITYA. Sir, i didn't get abt that interrupt n IR sensors why they r used n how they are arranged. how n when will be the interrupt routine will be start... plz explain..
to start the project, do i need any more items other than the below mentioned ones??? what must be the range of the crystal ossilator?? how many leds do i need if i am making a clock ? what is the use of an IR sensor in your circuit. The scope of the project is to design a display system using LEDs which rotate on a motor. The circuit is mounted on DC motor. LED'S are used to display clock and date. PICF84A is used to control and transmit the signal and utilizing the Assembly language. please help me on this i need the schematics for the pcb and how i should go about powering it up ASAP. so I m not getting hex file..plz guide me,thank you. is the circuit arrangement or both atmega8 n 8051? Sir can you explain the interrupt using IR sensor for example IR led and photo diode. how does it works if we want to display a Digital Clock. I would like to know more details about the components used like the resistor, capacitor values, etc. Resistor color coding exists for 220ohm but what does 220E mean ?? Reply as soon as possible. Anyone knowing about this doubt can clarify. but in most of the cases 33pf or 22pf are preferred. u are very helpful .. thanks for guiding all of the knowledge seekers ..
sir i am also making this project ..
for POV display _delay_us(); function is preferred more.. Excellent post! Thanks for this great info. Nice share! Thank u sir.....such a great work. thanks and i have one more question did you buy your development board to program the 8051 or did you make yours? Glad to see the post.It's awesome.Great idea use in this project.Really remarkable.Thanks for sharing the post.